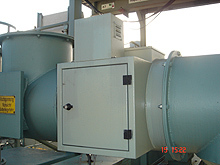 Our customer-orientated and efficient concepts and solutions for special requirements guarantee the cost-effective operation of exhaust gas cleaning systems and dust exhaust systems. Maintenance work on the system and a 24-hour hotline (+49 (0)172/ 538 9278) ensure the interference-free operation of the plant. In conjunction with this we offer online remote monitoring so that we can react immediately. One of the most important aims is the reduction of emission values according to the new emission law limits. We achieve this aim by taking gas distribution readings and then optimising the exhaust gas cleaning systems. This results in a reduction of pollution to the environment. It is our mission to preserve the environment as far as possible. Since our focus is on the increased efficiency, optimisation and improvement of safety requirements for exhaust gas cleaning systems, we research and develop continuously in this field of engineering.